The first of two Life Book lessons this week was taken by Donna Downey. The object of the lesson was to work in black and white. I often work with a limited palette including often just working in black and white. 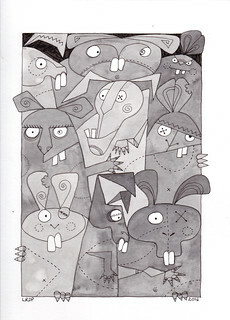 I decided, therefore, that I should apply a monochrome approach to a subject I have only ever tackled in colour before: zombie bunnies. Pretty much any excuse to draw my zombie bunnies, I will grab. 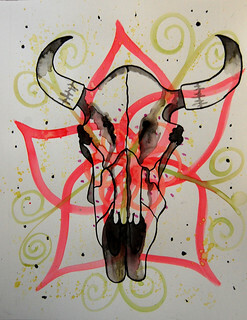 I used India ink for this piece, diluting in order to create the different tones of grey. It is interesting to see how different the zombie bunnies look when not in vibrant colour. My oldest son declared that they looked creepier, more menacing. My 10 year old said it looked like they were auditioning for a Universal monster movie. 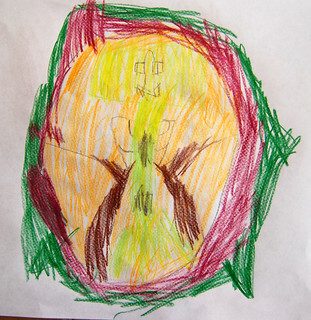 My 6 year old was home sick at the beginning of the week so he was arting alongside me. 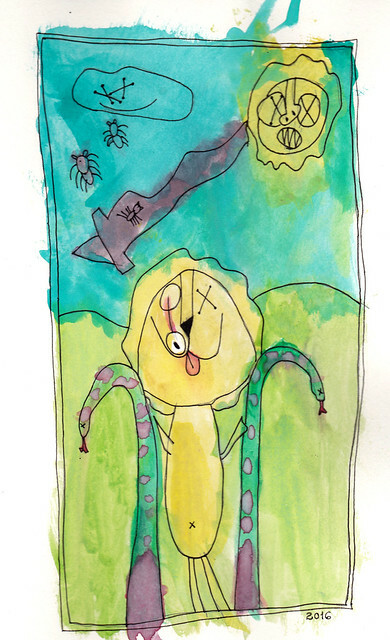 He decided to use watercolour to paint his own zombie characters, a zombie jungle scene apparently. I love the detail of the lion’s eyeball dangling out of the socket. And so we come to our final lesson in our History of Art project. It’s November and this project was supposed to only last for the summer break so, while in many ways it is a shame to bring it to an end, end it must. 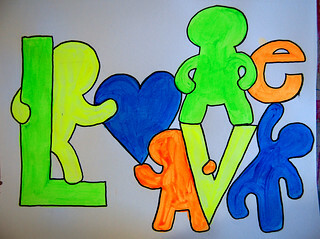 I chose Keith Haring for our final lesson. It seemed appropriate to end with a Pennsylvania born artist and I also had a feeling that the kids would really love his artwork, allowing us to end on a high note. We looked at lots of examples of Haring’s artwork and discussed why he might have felt inspired to use blobby stick men lacking facial features. We talked about the design of the figures being levelling, equalising across gender, race, age and other categories, resistant to labels, and how in many ways they were reminiscent of the stick figures our primitive ancestors were daubing on cave walls. We also talked about Haring’s use of bold, vivid, neon colours contrasted with thick, black outlines, the graphic quality of his work, and the way he meshed “high” and “low” art forms. We also got into a discussion about the use of art for political provocation and protest, specifically the way in which Haring used his “fun” art work to highlight subjects such as gay rights and HIV and AIDS. We also looked for recurring motifs and symbols across dozens of works. 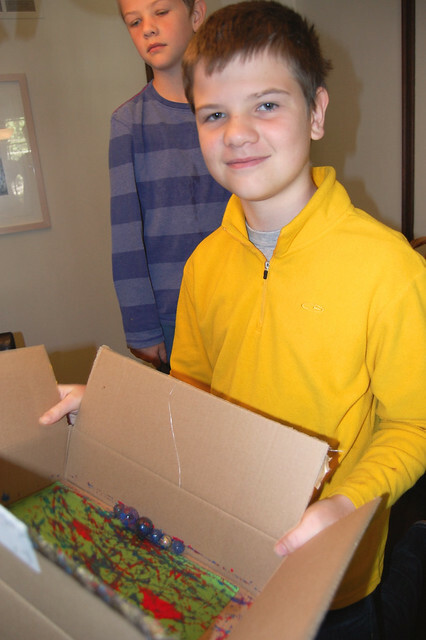 The boys were then set free to create whatever they wanted inspired by Haring’s works. My oldest and youngest were the only two who opted to paint. 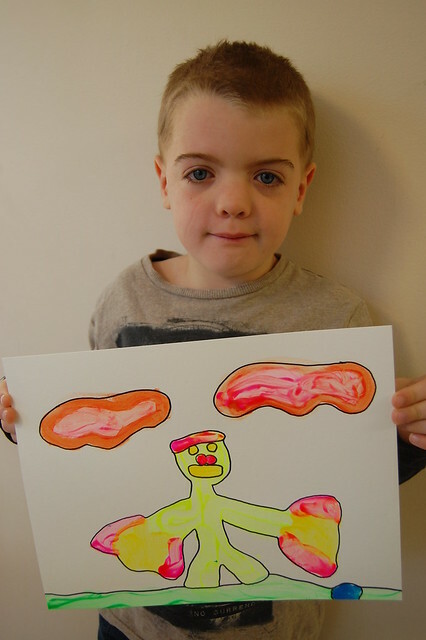 The 6 year old painted a figure whose arms end in wings, inspired by one of Haring’s paintings, but he could not resist the impulse to add facial features. 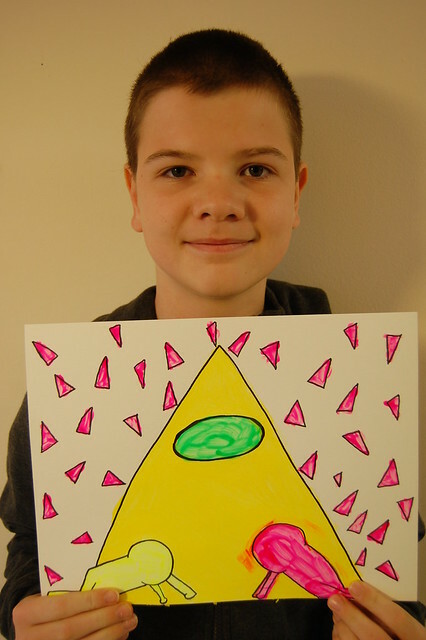 My 12 year old adopted some of Haring’s symbols – the pyramid, the pink triangles, the figures – to create his painting and discovered that drawing blobby stick figures is harder than it looks. 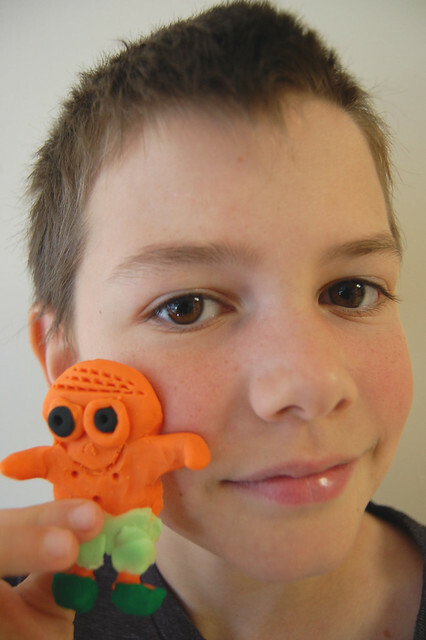 My middle two sons were keen to work with polymer clay again and saw the blobby figures of Haring’s artwork as a jumping off point for sculpting little figures. My 8 year old kept his small sculpture featureless but my 10 year old could not resist the temptation to add features to the figure. 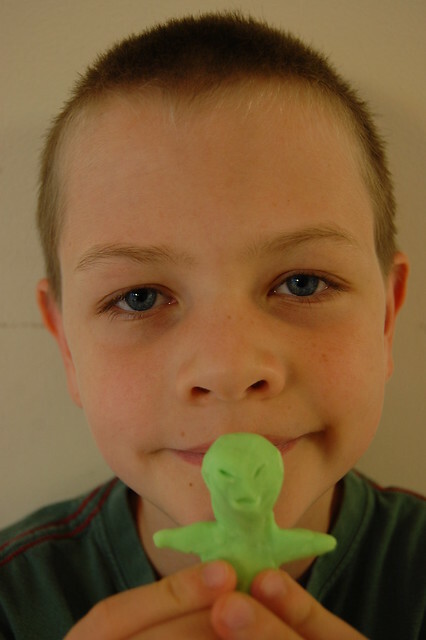 Specifically, he turned the figure into an alien. Since he used glow in the dark clay, the result was quite fun. 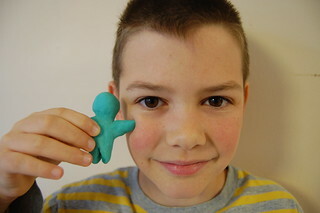 My youngest, seeing his big brothers messing around with the clay, decided to sculpt too. 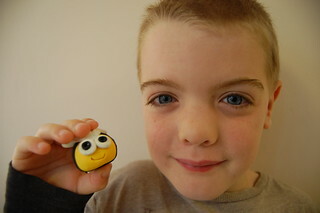 Thinking of bright colours and black lines, he decided to make a bumble bee. I think it turned out super cute. I worked in my art journal to create my Haring inspired painting. I have not worked with neon paint since my chameleon over a year ago. I didn’t find it any easier to work with this time around. It goes on really thinly and the brush marks are always visible so that my scrappy, messy painting style is terribly evident. The subject is probably obvious: my love for my four little Pictlings. We have had a lot of creative fun and interesting discussions and a whole lot of learning while undertaking this History of Art project. Our recent trip to the Philadelphia Museum of Art proved that the learning was sticking. My 8 year old also recently impressed his art teacher by knowing a whole lot about Chagall. I also like to think that my boys have been inspired to just keep creating and to find inspiration all over the place, to try different media and try on different styles to see what fits. I hope you have enjoyed reading about our project these past few months. Now I need to have a think about what our next project will be. Suggestions are always welcome! We have arrived at the penultimate lesson in our History of Art project. The artist being covered was Andy Warhol and I knew his graphic style, his bold use of colour and his allusions to pop culture would appeal to the kids. They were able to see the genre connections to Roy Lichtenstein’s art work right away which was pleasing. We spent a lot of time looking at and discussing various Warhol paintings and prints. It was interesting how much the art appealed to the boys’ sense of fun but there was not the same depth of discussion as there has been about many of the other artists we have studied. We covered Warhol’s commentary on mass consumption, commercialism and celebrity but otherwise the discussion was pretty superficial. Interesting. I thought for sure that my 8 year old, as a massive fan of the king, would choose to work on his own version of an Elvis print. 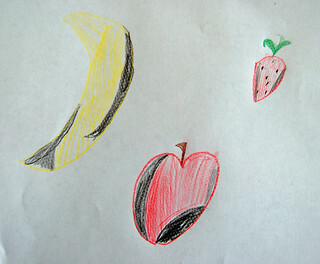 He surprised me, however, and instead took his inspiration from the banana on the Velvet Underground’s album cover. 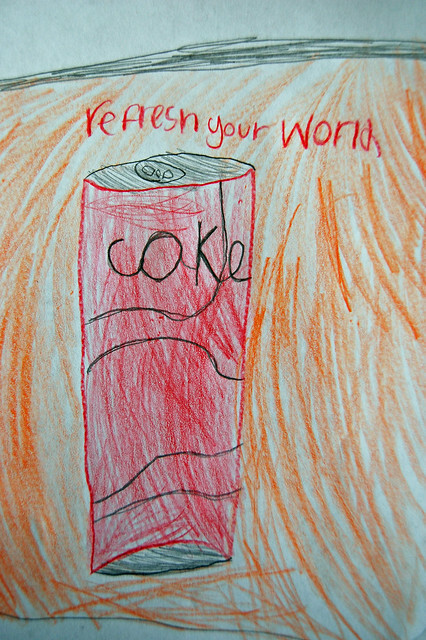 My 10 year old liked the idea of playing with iconic brand logos and so drew a can of coke from memory. My 12 year old continued on his mission to make every drawing about either Minecraft or penguins and created a series of four Creeper portraits instead of Marilyns. 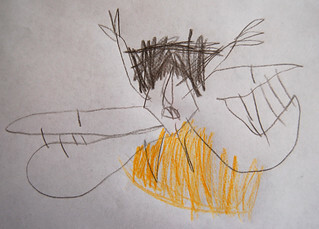 My 6 year old went completely off piste and churned out several drawings. 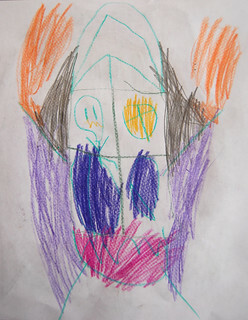 I never ask my kids, “What is this?” so I cannot relay to you what his drawings depict. He was inspired and he loved drawing. That’s all that really matters. Like my 10 year old, I went with Warhol’s use of brands and logos as my inspiration. 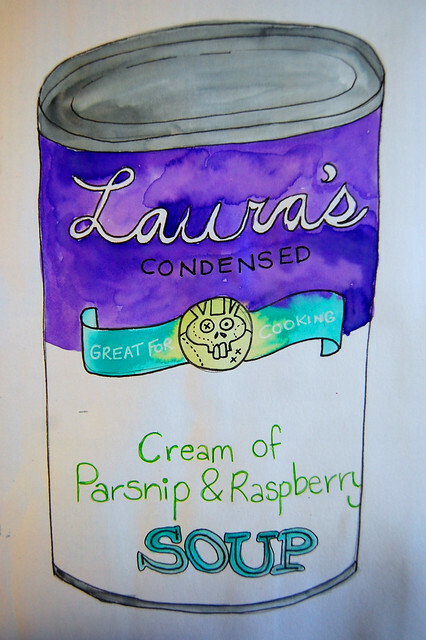 The Campbell’s soup can series was my jumping off point but I put a Halloween twist on things by combining my favourite fruit with my favourite vegetable to make a disgusting concoction, adding a zombie bunny to the logo and using unappetising colours. My kids were over the moon when I announced that Roy Lichtenstein was the next artist we were studying in our History of Art project. My oldest reads a lot of graphic novels and my younger three are comic book aficionados so the aesthetic of Lichtenstein’s art really appeals to them. I introduced them to the concept of Pop Art and its use of popular mass culture and everyday objects as inspiration for art work. 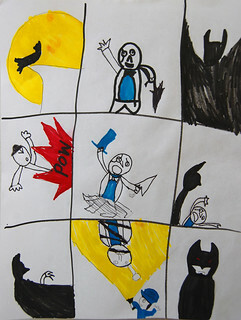 Their familiarity with comic books meant that the boys found it easy to identify the elements that Lichtenstein used in his art work: strong black lines, primary colours, Ben Day dots, speech bubbles and onomatopoeia. The boys all unanimously decided to use sharpies as their medium for their Lichtenstein inspired drawings. 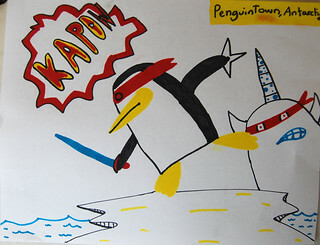 My oldest continued with his penguin theme and drew a ninja penguin and his narwhal sidekick. I think he did a great job with the composition. 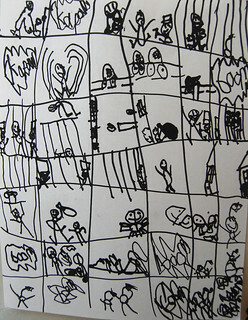 My youngest drew a whole comic strip. He can be a wee perfectionist and gets frustrated if a line or shape is not exactly as he intended. He uses the eraser a great deal. I was curious, therefore, about how he would handle drawing directly onto the paper with sharpie. I was predicting some sort of flap and maybe a few scrumpled first drafts. However, he worked diligently and precisely and with no eruptions. I have no idea what the story is about. My middle two sons are obsessed with Marvel and DC comics and characters so I knew that was what they would opt for in terms of subject matter. My 8 year old loves Robin so that was what he plumped for. 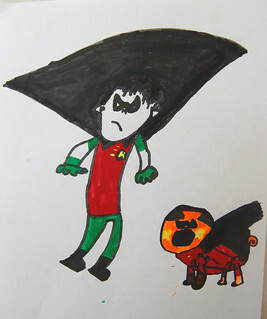 He is also obsessed with pugs so his Robin has a super-pug sidekick. I think his drawing has a lot of personality. My 10 year old opted for Batman and a showdown between him and Penguin. I like his sparing use of colour and I think he has a strong sense of composition. 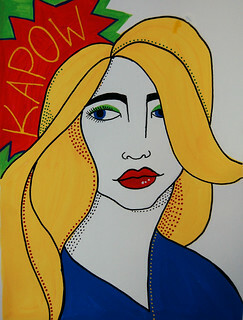 I drew a face in my art journal and used the black lines and bold colours in order to emulate Lichtenstein. I didn’t want to go dot crazy so I just used a few in certain places and I then added the “Kapow” in one corner even though in the context of the drawing it makes absolutely no sense. You can see my Lichtenstein Dotty Bunny over on my art blog. The next artist in our History of Art project was Jackson Pollock. I must admit that I found teaching the boys about Pollock to be quite challenging because I don’t really “get” Pollock myself. I appreciate that what he did to the art world was shake it up by being innovative, by placing the emphasis on the act of applying medium to substrate rather than on creating any preconceived image. I, therefore, spoke to the boys about the dynamism of Pollock’s art work, the transference of his physical energy and the motion of the liquid media into the energy of his “action paintings”. We also spoke about how Pollock moved away from traditional modes of painting by placing his canvases on the floor so that gravity assisted him rather than using an easel and working upright. My original plan for getting the kids to have a go at “action painting” had been to place a large piece of paper outdoors and get them to splatter and throw and drip paint all over it. 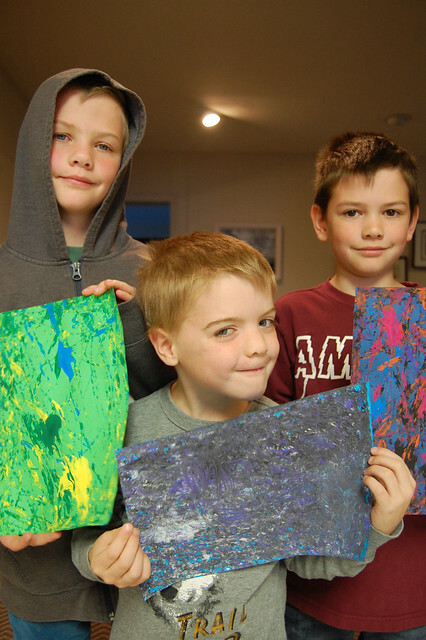 However, we had two days of sub-zero weather this week so our arting had to be done indoors and I wasn’t about to let four boys throw paint around inside the house. We, therefore, used the back up plan which was to use marbles and blobs of paint to move the paint around. It still gave them the idea of using kinetic energy in a less controlled way to construct a painting. 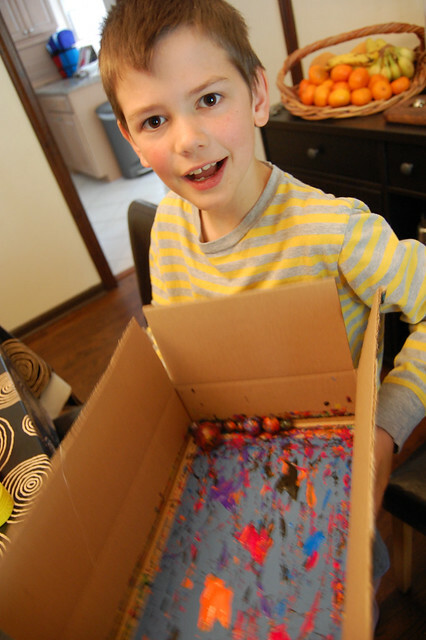 They had an absolute blast dripping paint onto the paper and then rolling the marbles around. It was good messy fun. 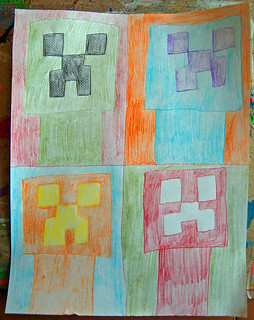 My oldest cut up his Pollocked paper in order to continue with his Minecraft theme. He turned it into a Creeper. 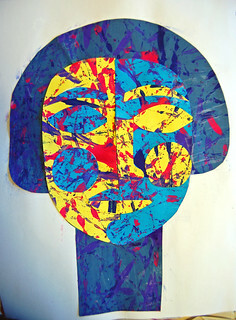 I decided to follow his lead and so I cut up the papers I made as demonstration pieces with the kids and turned them into a simple collage of a female head in my art journal. Unlike Jackson Pollock, it seems I have to impose some sort of order on my art work. This weekend we found some time to continue with our History of Art project which is finally nearing its conclusion – thankfully, given I had only intended for it to be a summer project. Next up was Georgia O’Keeffe – a female artist at last! We looked at her flower paintings and discussed their focus on colour and shape, the fluid lines, the idea of focusing on tiny details and transforming them into huge images. The boys are not ready for Freudian interpretations so we didn’t touch that topic. We also looked at her desert landscapes, her recreation of the colours of the geology of the region, the quality of light, the desert plants and the bleached skulls of animals. That led to a brief conversation about painting both life and death. It was inevitable that the boys would all plump for drawing skulls as soon as they saw O’Keeffe’s paintings of animal skulls in the desert. There I was talking to them about using large brushes for painting flowers and mixing the sort of colours O’Keeffe used for her flower paintings and all the while I probably knew the boys were just thinking, “Bring on the skulls, mother!” If we ever stumbled across a skeleton when out on a woodland walk we would react as if we had just found treasure. Impromptu lessons on animal biology and adaptations would take place but so would a lot of poking with sticks. Confession: we have a roe deer and a badger skull on a shelf in our basement. So, yes, the drawing of skulls was inevitable. 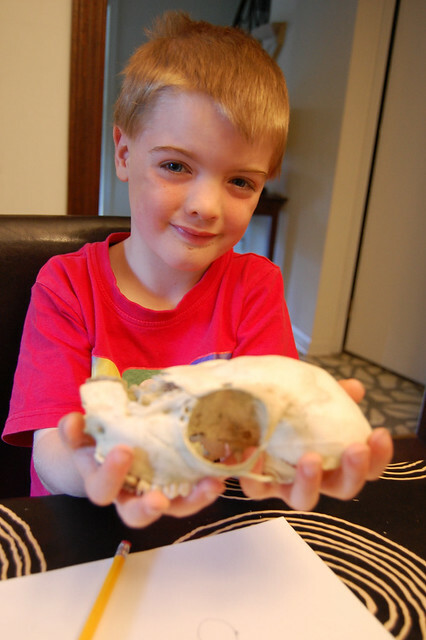 My 6 year old immediately scurried off to the basement to grab the deer skull. It was a great opportunity for me to teach him about observational skills and drawing while looking and the use of contour lines to build up a drawing. I think he did a wonderful job. 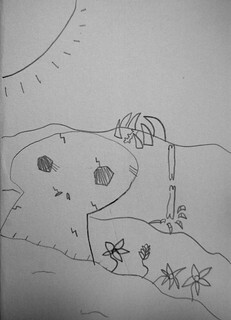 My 10 year old drew a skull, part of a spine and arm bones forming part of a desert landscape. He had intended to colour it in but then decided to go and play on the PS3 instead. 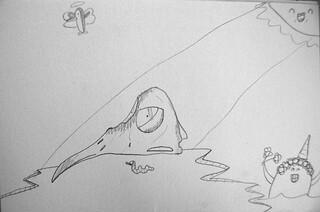 There is something about his drawing that makes me think of the skeletised dragon in the desert of Tatooine in ‘Star Wars’. My 12 year old, in keeping with his determination that every drawing has to be either Minecraft or penguin inspired, decided to draw a penguin skull. 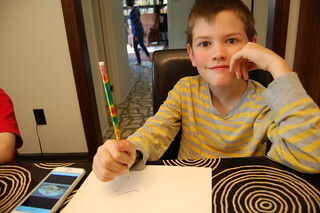 He googled to find a photo of a penguin skull and drew from that. He then added a little penguin angel floating in the sky, a happy sun, and a smiling narwhal. A pretty peculiar wake. 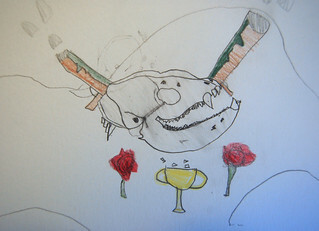 My 8 year old has a minor obsession with raccoons so he decided that the subject of his drawing would be a raccoon skull. We don’t own one of those so he pulled a photo of one up on my phone and then set about drawing. 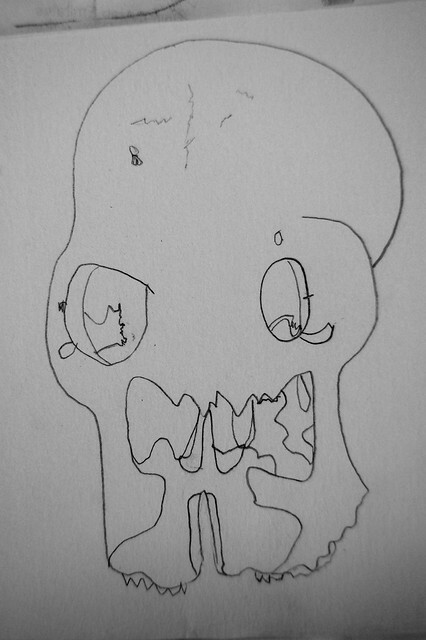 I think his drawing of the skull has incredible detail in it and I am very impressed with it. He plays electric guitar and had been listening to Guns ‘n’ Roses for inspiration so the motif from that band also found its way into his drawing. I too succumbed to the lure of the skull. When I was in High School, my art teacher had shelves filled with interesting objects we could draw or take inspiration from and among the items were several skulls. I used to draw them quite often – but not as often as I drew his collection of battered old leather footwear. My skull drawing skills are pretty rusty. I started, however, with a floral doodle in watercolour. It is the same flower doodle I have been drawing for almost my entire life. I then did the same as my 8 year old and brought up a photo of a skull on my phone but I challenged myself to draw in India ink, with no pencil under drawing, so that I had to work with any errors or flaws, no erasing possible. That explains the lack of symmetry. The horns are ridiculously imbalanced. I am quite happy with the quality of the drawing, however. The boys were off school yesterday on Columbus Day – or “Let’s Swap Land For Smallpox Day” as my 8 year old calls it – so we were able to explore another artist in our History of Art project. Our previous lesson was on Magritte and we stuck with the surrealist movement because Salvador Dali was up next. When visiting Glasgow, one of our favourite places to go and spend time was the Kelvingrove Art Gallery and Museum. One of the most famous paintings in its collection is Dali’s sublime ‘Christ of Saint John of the Cross‘ and, as such, the boys were very familiar with that painting. As part of our studies, however, we looked at several of Dali’s more typically surrealist works with particular focus on ‘The Elephants’ and ‘The Persistence of Memory’. The boys were all aware of the “melting watches” mainly from the iconic imagery being referenced and parodied elsewhere. While we chatted about what Dali was perhaps communicating about the meaning of time and memory, the boys were more fascinated by his playing around with solid forms becoming liquid and less substantial. That then became the inspiration for the creative element of the lesson. 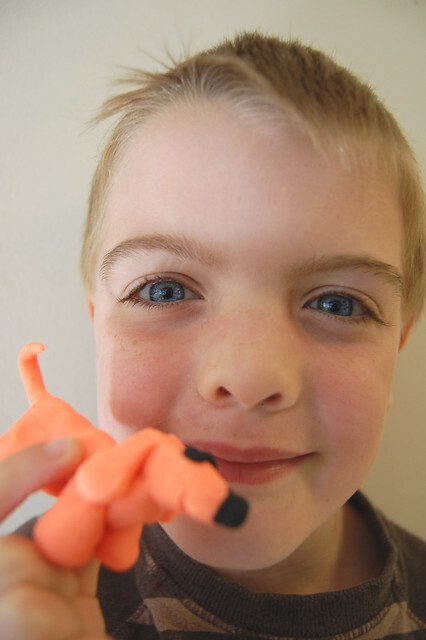 We got out our small collection of polymer clay and the boys created “melted” sculptures. 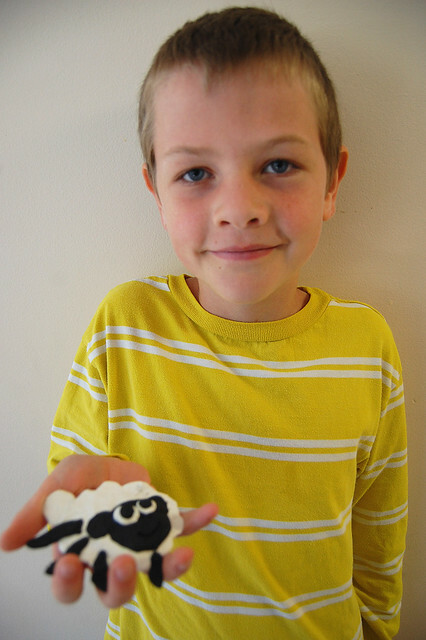 My 10 year old sculpted a flattened sheep. It looked like Shaun the Sheep after meeting a steam roller. I think it is delightful. 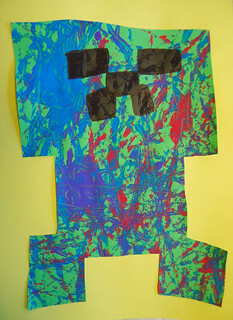 My 8 year old appropriately went a bit random and surreal and made a melted pirate character. My 6 year old got carried away with playing with a new medium and rather forgot about the Dali part. 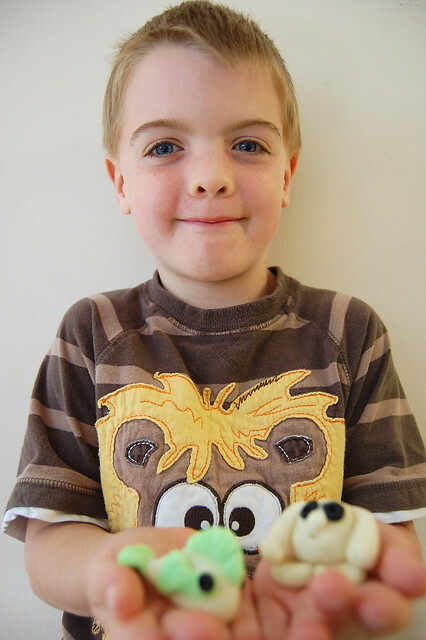 He used some glow in the dark clay to make a sausage dog, a fish and a funny little blobby figure. He did a great job. 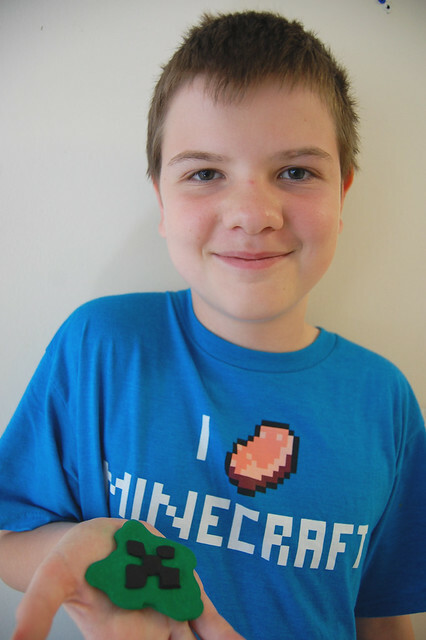 My 12 year old, continuing with his Minecraft theme, made a melted Creeper. I decided to take my inspiration from another Dali painting we had looked at, his ‘Ship with Butterfly Sails’. I used the idea as the basis of a collage in my art journal. 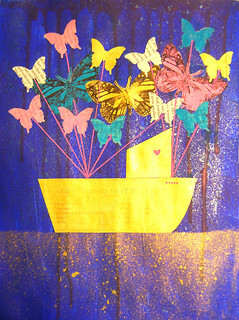 It has not photographed well but the boat shape and some of the butterflies as well as the spatter are gold. PS I have started an altered book project and am sharing the art work over on my art blog.